life/living in Korea lessons in the past week and a half, and I thought I’d share some here. 1) The School Shoes Incident. My first mistake in this incident was not taking seriously my friend Gail’s post about the sandals worn at Korean schools. I read it, found it amusing, but shrugged off the idea that the teachers at my school would all be wearing sandals inside. Indoor shoes, maybe. But a specific type of black sandal? I was wrong. I’m not sure what it’s like at Hogwans (private learning centers – yes, close in spelling to Hogwarts), but at public schools, the indoor sandal seems to be the norm. Since I had ignored Gail’s blog, I brought my own pair of simple black flats on the first day. Young Rak did not hesitate to inform me that everyone else was wearing sandals “Like this,” he lifted his foot, but that – naturally – it was my choice. A few days later I was shopping at E-mart (supposedly the Korean version of Walmart), and I saw the sandals hanging everywhere. As they were inexpensive (under $10), I decided that conforming wouldn’t be so terrible. I bought a yellow pair – fun! – with lots of raised bumps that appeared to be foot support. I was pretty excited about the yellow – it’s my favorite color, but it washes me out so I can’t wear it near my face. Shoes=perfect solution. 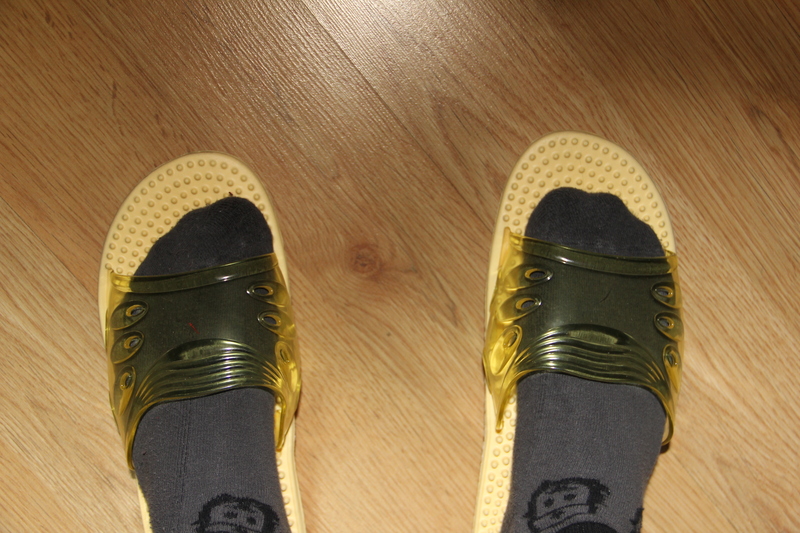 Long story short(er), I arrived at school the next day, toting my new yellow sandals. Young Rak laughed when he saw them, and I thought maybe he thought the color was outlandish. Nope. “Those are shoes old people wear,” he said. Speaking of shoes, I would bet a tidy sum of money that the first Cultural Crime that all ESL teachers in Korea commit takes place at the threshold of their apartment. After an exhausting, long amount of travel from their home country, they are led to their room, lugging their suitcases. The minute they step away from the entrance into their room, they are met with the shocked gasp of their co-worker/whoever picked them up. 2) The Arm and Hammer toothpaste incident. Here’s a bit of advice for life in general. Don’t ever buy toothpaste in bulk if you haven’t tasted it before. (*Also not recommended for corn dogs.) While I was still in my Treat7-11asmypersonalgrocerystore stage, I found a four pack of Arm and Hammer toothpaste. I bought it. My reasoning went something like this: “Ooh American words. Ooh American brand that I recognize.” Yes, I recognized Arm and Hammer. I recognized it because it is a BAKING SODA brand that makes baking soda. Basically the toothpaste tastes like baking soda. And that grosses me out. And being grossed out by toothpaste should be at the top of a list of bad things. But there’s nothing I can do because I’m too cheap to go buy more toothpaste when I have four tubes at home. Speaking of toothpaste, the kids and teachers at my school bring their toothbrushes and paste, and brush in the bathrooms after lunch. Wow. Hygiene win. Well that was only two lessons, but I’ll stop for now. To be continued. Here are some articles for the meantime. A teenaged polyglot – a young man who is a compulsive language learner, and America’s habit of “stealing the world’s doctors” – an unsettling piece about how the world’s brightest doctors are settling in America at a high cost to their home countries. Ah! Just remembered you’d be in Korea by now and so I looked you up on Facebook so I could find your blog. I giggled quite a bit reading different things on here that I have also encountered. Aka: chicken places everywhere, right?! Also, I’m quite impressed you tackled the bus system so quickly. I JUST started using them, and actually love them because they’re faster and you get to see so much more than the boring old subway. Do you have a subway where you are? Because that’s super easy since everything is in Korean and English. Annyways, I’ll stop rambling but let me just say that I haven’t encountered the no-shoes-at-work-conundrum because, I think you’re right that hagwans don’t do that. But the Korean staff do brush their teeth at work! So crazy, right? Glad you’re doing well!! Hey! Yeah I’ve been here almost two weeks now. Oh, I much prefer the buses to the subway – not that I have a choice, as I’m about a 20 minute ride from the nearest subway. Also, the bus to Seoul is faster (direct) than taking the bus/subway. You were right about the trash/recycling system being crazy. I’m still working on it:P How’s the hagwon going? got a good routine? It’s good! They increased my hours so I’m working more, but it’s cool because I got lucky and have a hourly contract so I also get paid more which is never a bad thing! We should try to meet up sometime. I’ll definitely let you know if/when I’m in Seoul again. How long is the bus ride for you to Seoul? Also, you should swing by Busan sometime in the summer and we can go to the beach! The bus ride to Seoul is about an hour. It’s just one bus, so that’s nice, and I’m used to sprawling cities, so an hour isn’t too bad. Sweet that you have an hourly contract! I think a lot of teachers work waaay overtime. I actually really like the public school deal; only teaching 22 hours a week and if more classes are added I get paid extra (or get extra vacation). Still, it would be nice to have some more English speakers here. I’ll definitely take you up on Busan in the summer – I love the beach. I don’t know why I didn’t fight for a beach spot:P And I think there’s like a 2 hour train to Busan.